Japanese knotweed is in the Buckwheat family, and is generally not liked in western nations because it can grow up to one metre per month, its roots travel over three metres deep, and they spread up to 7 metres in every direction. It grows through concrete, asphalt, dams, and buildings. Japanese Knotweed is known as Polygonum cuspidatum in North America, in Europe it is known as Fallopia japonica. It is a very tolerant plant and survives in a wide range of soil types. Its rhizomes can survive temperatures of −35 °C (−31 °F). Distinguishing Features: In the early spring, Japanese knotweed looks like nondescript fat, green, red-flecked stalks poking up from the ground. Although the young leaves are hard to identify, the big clue to the plant's identity are the dead stalks from the year before. They resemble bamboo, are hollow, lightweight and have wooden-like stems. 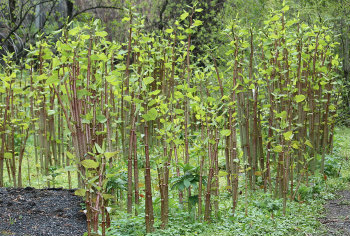 By early summer the mature Japanese knotweed stems are hollow with purple speckles and are very tall. The leaf growth alternates on each side of the stem creating an obvious knotweed zigzag pattern. Flowers: The white flowers are very small but numerous and they form showy, greenish-white branching panicles from the axils of upper leaves. These ‘spike’ of flowers are about 10cm in length. Japanese knotweed usually flowers from July to September. Fields of Nutrition has medicinal benefits and vitamin/mineral content of Japanese Knotweed. Leaves: Japanese knotweed leaves are alternate, broadly ovate, square-cut or slightly angled at the base, abruptly pointed at the tip with the tip often stretched out, colourless and are hairless. Height: The Japanese knotweed can grow up to one metre every month and can reach heights of up to four metres. 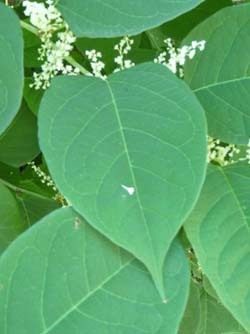 Habitat: Japanese knotweed can tolerate a variety of adverse conditions, including dense shady areas, high temperatures, high salinity soils and drought. Knotweed is commonly found near water sources, in low-lying areas, waste areas, and around old home sites. 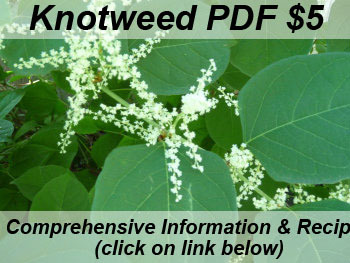 Japanese knotweed is native to Japan and grows in Canada, U.S., England, some parts of Europe, Australia, New Zealand, China, Korea, and eastern Asia. Edible parts: The best edible part of this plant are the young shoots, preferably when they are about 15-20 centimetres tall (6-8”). Depending on your taste buds you may think they have a lemony taste, some say it is more like rhubarb. Young shoots can be consumed raw or cooked and the growing tips and the unfurled leaves on the stalk and branches are edible. Stems can be sliced and steamed, simmered in soups, used in sauces, jams and fruit compotes. Japanese Knotweed is a great source of vitamins A and C. It also provides many vital minerals including iodine and is loaded with resveratrol. Similar plants: Polygonum sachalinense, Polygonum aubertii.